Don't count on poison pills. The only poison pills Democrats care about are for underaged girls to get over the counter. 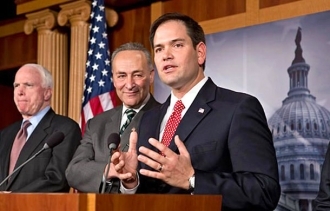 Great progress made today: Senate overwhelmingly voted to bring #ImmigrationReform to debate. Let's fix this broken system. TOM: It is time to deport the criminals: The Republican traitors pushing this. TOM: The Gang of Eight are Liars And if Obama supports it, how could it be good for the USA? What this new set of laws will do is essentially add 30 million new legal voters over a decade’s time, nearly all of them permanent clients to a big corporatist government determined to expand and entrench its power. What it won’t do is secure the border in any way. And whatever provisions it claims to offer as stepping stones on a path to citizenship are set-up for juridical overturn: different “classes” of citizens won’t hold legal water, and they know it. It’s theater. Here it is in plain, clear English: The ruling class plan to defeat the TEA Party and the small-government base of the Republican Party is to import enough new progressive voters to offset the influence of we, the people. Whose only remaining function will be to subsidize the people and programs that ensure our own subjugation to the State. We become draft horses to the Beltway crowd’s plantation overseer. Powerline: With Ryan on board the fix may be in (you better start panicking)! Talk is cheap & Gang of 8 bill is full of empty promises. Let's seriously address border security & fix our broken immigration system. I think you cover everything here, EBL. Good stuff!